* For those unfamiliar with Hollywood Fringe Festival (FB), there are over 350 different shows occurring in the heart of Hollywood, with most along the stretch of Santa Monica Blvd from Western to W of LaBrea, and between Hollywood Blvd and Melrose. The shows run from 5 minutes to 2 hours, from one person shows to gigantic casts, from mimes to musicals. They have one — and only one — thing in common: they have to be able to load into a theatre in 15 minutes or less, and get out afterwards in the same time. You never know what you will see: it could be complete crap, it could be the start of a major new show. The shows and scheduling thereof are a nightmare to coordinate, but you could easily end up seeing four to five shows in a day. However, you can be guaranteed of a good time. I’ve been a long-time admirer of Steve Allen and his intellectual work. From his comedy work to his work with Meeting of Minds, he was an intellectual and artist that we haven’t seen in a long time. But his most endearing work was his work with CFI: The Center for Free Inquiry, whose goal is to “foster a secular society based on reason, science, freedom of inquiry, and humanist values.” He was so influential there they even named a theatre after him in Hollywood, which (sadly) has been demolished. Ingersoll was the friend of Presidents, literary giants like Mark Twain, captains of industry like Andrew Carnegie, and leading figures in the arts. He was also beloved of reformers like Elizabeth Cady Stanton. Other Americans considered themselves his enemies. He bitterly opposed the Religious Right of his day. He was an early popularizer of Charles Darwin and a tireless advocate of science and reason. More, he argued for the rights of women and African-Americans. In short, Ingersoll was a progressive and free-thinking voice that is even more relevant today, in an era where many who profess to be “Christian” are more enamored of power and supression of thought than being the voice of compassion and reason. This production was an extended version of the HFF17 production: esstentially, it consisted of Robert Ingersoll, portrayed by Ernest Kearney (FB), giving an hour-long speech. Kearney “wrote” and adapted the piece, all of which (except for 30 words) were drawn from the actual speeches of Ingersoll. many of which are online. Social relations depend upon almost an infinite number of influences and considerations. We have our likes and dislikes. We choose our companions. This is a natural right. You cannot force into my house persons whom I do not want. But there is a difference between a public house and a private house. The one is for the public. The private house is for the family and those they may invite. The landlord invites the entire public, and he must serve those who come if they are fit to be received. A railway is public, not private. It derives its powers and its rights from the State. It takes private land for public purposes. It is incorporated for the good of the public, and the public must be served. The railway, the hotel, and the theater, have a right to make a distinction between people of good and bad manners — between the clean and the unclean. There are white people who have no right to be in any place except a bath-tub, and there are colored people in the same condition. An unclean white man should not be allowed to force himself into a hotel, or into a railway car — neither should the unclean colored. What I claim is, that in public places, no distinction should be made on account of race or color. The bad black man should be treated like the bad white man, and the good black man like the good white man. Social equality is not contended for — neither between white and white, black and black, nor between white and black. When I got somewhat older, I found that nearly all people had been guilty of substantially the same crime — that is, that they had destroyed the progressive and the thoughtful; that religionists had in all ages been cruel; that the chief priests of all people had incited the mob, to the end that heretics — that is to say, philosophers — that is to say, men who knew that the chief priests were hypocrites — might be destroyed. I also found that Christians had committed more of these crimes than all other religionists put together. Kearney brought Ingersoll to life, and spoke words that needed to be heard in this day and age. Even though they are from around 150 years ago, they still apply. Once can clearly see why the religionists in power feared this man, and even essentially banned him from speaking in a number of states. Consider the impact of his speaking today? This is a show that everyone should see for the message that it brings back from the past, that remains relevant — especially so in the Era of Trump. That Ernest Kearney (FB) is the fellow that brought this message to the stage is no surprise. I remember him from the days of Bitter Lemons, the site run by Colin Mitchell that morphed into the current Better Lemons** under a different publisher after Colin left in a boat on the sea of controversy. Kearney then, and is now, a strong writer with a sense of muckraking; his selection of Ingersoll for this piece fits into that. It disturbs the comfortable, and as a great Rabbi I knew once pointed out, sometimes the comfortable need to be disturbed. I’ll note that the production is dedicated to Colin. Theatrically, Kearney embodied the man well, although at times there was this odd smile I might call Phlox-like. It was an engaging oratory, under the direction of Dennis Gersten. Production-wise, I only had one complaint — which, as I was at a preview performance, hopefully can be fixed: the lighting. Basically, the lighting was such that I was constantly aware of it, turning around at times to see why it was constantly changing. Lighting should be a subtle mood enhancment; it shouldn’t draw attention to itself. In this production, it did. The reality is that this was an oratory: the lighting didn’t need to change, it only needed to illuminate the speaker. I spoke to the person running the lighting, Pam Noles, and she indicated she was just following the director’s instruction. So I urge the director: Simplify the lighting! Ingersoll’s speeches are great, and Kearney delivers them well. We don’t need the lights to distract us. The production was produced by Marlene Kearney and David Naire. **: As an aside, as someone who is considered a reviewer by Better Lemons, I’m not 100% sure it is better. In the “Bitter” days, reviews were grabbed by the folks at the site for their Lemonmeter. Today, reviewers need to submit their reviews, and alas, most of the time I attempt to submit a review, the show I want to review hasn’t registered on the site, and thus I can’t review it. That was the case for yesterday’s From Toilet to TInseltown— and one would expect a site that works closely with Fringe to have all Fringe shows registered. But that’s also the case for the other shows at the Hobgoblin, and was the case for the Ahmanson’s Soft Power. Although you don’t have to pay to register shows, the fact that you can only review registered shows — and thus the universe of Southern California theatre isn’t represented — leaves a — shall we say — bitter — taste in one’s mouth. Our second Fringe show, The Universe (101), involved time travel of a different nature, and was an absolute hoot. I’ll note that we met the performers for the show while we were in line for Ingersoll, as they were promoting their show by handing out postcards. Their transformation for the show was amazing. 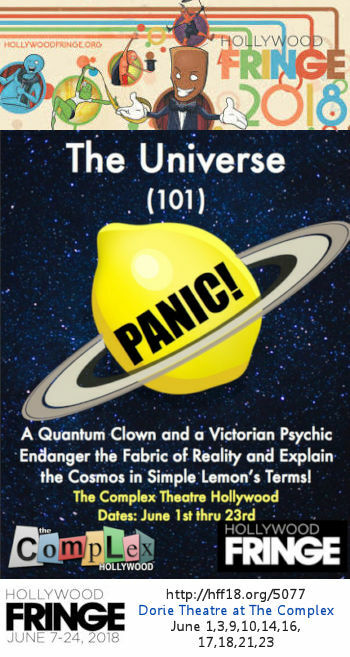 Imagine what happens when you put a Quantum Clown and a Psychic Comedian in the same room! Join two great internationally acclaimed variety acts Norbut Yetso and Evanion the Great as they join together for a trip across the realities in ‘The Universe (101)’. Norbut has constructed a Modest Hadron Collider which unexpectedly pulls the great Mind Reader and Psychic Evanion from 1865 to the present, creating a paradox that needs to be solved before we all wink out of existence! Expect mayhem, mirth, audience interaction and grand feats of mental mystery as our two erstwhile heroes battle to save the Universe as you know it! The sillyness started from the moment we walked into the theatre. There were warning signs that the show might result in random gender reassignment — but we should stay in our seats. Audience members were recruited to help mount a box containing a possibly dead cat on a hoist to the rafters. They even recruited me to move a radioactive lemon from one side of the room to the other. There were sparks and explosions and all sorts of sillyness. The two performers, Ian Harvey Stone (FB) as Evanion and Matthew Godfrey (FB) as Norbut Yetso bring an energy and sense of zanyness to their characters that makes the show irresistable. They play, they clown, and yet have an earnestness in what they are doing that makes it all work. There is magic (I’m still not sure how they did the twist at the end), and there is science, and it all comes together in a wonderful whole. They only made one mistake: They attempted to bring me — a cybersecurity engineer who is a professional audience and can’t play characters — onto the stage to attempt to hypnotize me. It didn’t work, but luckily they had two other volunteers that were able to save the day. Perhaps I should explain. The conceit of the show is that Yetso, a quantum clown, has made the Medium Hadron Collider. He activates it and tosses a lemon through, which ends up bringing into 2018 a spiritualist from the 1800s. They then have to figure out how they might be able to get him back, running into Schrodinger’s paradox and running into Schrodinger’s paradox and running into Schrodinger’s paradox until they discover that they’ve brought on the destruction of the universe itself. Quantum physics can entangle you like that. But they then devise a way — with audience help — to solve the problem. At least that’s what I think happened, but then again, I’m not sure I saw the show. I do remember running into a fellow handing out postcards. In any case, the show was great. Ian Harvey Stone (FB) and Matthew Godfrey (FB) not only performed in the show, it was their entire production: they created it, produced it, wrote it, directed it, and designed it. It was a really clever undertaking that I recommend to all. ✔ Sunday, June 3: 4:00pm Ingersoll Speaks: Again (Studio C); 6:00pm The Universe (101) (Complex/Dorie).